An exciting special promotion on the stunning new Jeep Renegade, using a twist on the famous ‘Black Friday’ sales event, has been launched by the iconic SUV brand. 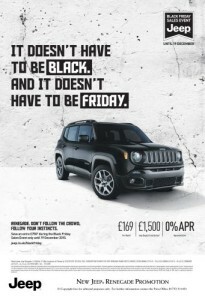 Under the banner ‘It doesn’t have to be Black, and it doesn’t have to be Friday’, the new campaign seeks to offer a great deal to customers considering the new Renegade small SUV, but allows them any day of the week to sign up for one – until 19 December. Following on from the record-breaking Black Friday last week (27 November), the new Jeep campaign expands and develops the nationwide mega-discount promotion and offers an extra £750 off a new Jeep Renegade for the special limited period. The promotion is valid atparticipating Jeep dealers and on selected stock vehicles. The advertised suggestion is to use the £750 to reduce monthly payments to just £169 per month , for example, on a Renegade 1.4 140hp Longitude, using a Jeep Horizon PCP at 0% APR representative, with customer deposit of £3986 and optional final payment of £10,272. And it doesn’t only have to be on a black car – Jeep’s advertising campaign suggests ‘Alpine White Monday’, ‘Colorado Red Tuesday’ and ‘Solar Yellow Wednesday’, but there are 11 colours in total to choose from. “This is an outstanding promotion which brings further savings to an already excellent value for money car,” says Damien Dally, head of brand, Jeep UK. The Jeep Renegade range starts at £17,295 OTR for the 1.6E-TorQ Evo Sport, rising to £28,595 for the 2.0 MultiJet II Trailhawk. For more information customers should go to www.jeep.co.uk .